MidCoast for a four-night stay in Boothbay Harbor, one of Maine’s prettiest coastal towns. 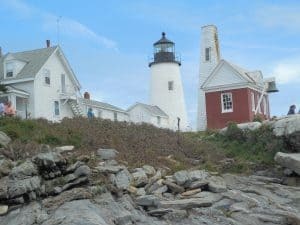 The MidCoast & Islands region, with its charming harbor towns and quaint country villages, is home to some of Maine’s most scenic rocky coast and many of its iconic lighthouses. And the lobster is fresh and abundantly available. 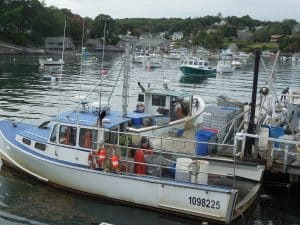 We chose to stay in the Boothbay Harbor area for its central location to many of the attractions in the MidCoast area. The first inn we stayed in was exceptional for many reasons . One reason is its idyllic location in East Boothbay, just 3 miles from Boothbay Harbor. Perched on a small hillside overlooking Linekin Bay, Five Gables Inn is a beautifully restored 115-year-old Inn. Five Gables offers a perfect opportunity to relax and absorb a postcard-like vista of moored boats on the sparkling bay. Each afternoon, following a day of activities, we retired to the spacious wraparound porch with a glass of wine and reveled in the serenity. The Inn’s welcoming common room also has wonderful views of the bay and is often warmed by a crackling fire. We loved waking each morning to the enticing aromas of a homemade breakfast. Each afternoon a restorative beverage and delicious homemade pastry is put out. In the evening a selection of dessert wines awaits guests – all complimentary. Each of the Inn’s 15 rooms is unique, all with the feel of a coastal Maine cottage with picturesque views of Linekin Bay. Across the street is a dock perfect for access to swimming or for relaxing in the sun. Innkeepers Steve and Susan Plausteiner are friendly and eager to help with suggestions for enjoying all that the region has to offer. 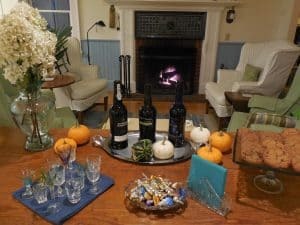 Five Gables Inn is open from mid-May through October. this pretty coastal town’s activities. 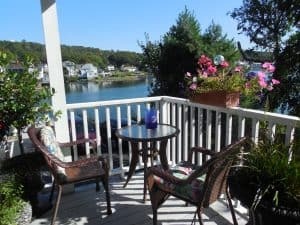 The Harbour Towne Inn on the Waterfront offers 12 Victorian-styled rooms, many with private decks and scenic harbor views. Each room is meticulously decorated with numerous romantic touches. A spectacular penthouse suite has two bedrooms, a full kitchen, dining area, living room, and private deck with wonderful views of the harbor. Lush gardens and colorful flowers surround this gracious B&B Inn. Sisters Stefanie McElman and Tricia Richardson continue the family’s three generations of gracious Down East hospitality. A delicious and bountiful breakfast is served each morning in the sunny sitting parlor. On warm sunny days breakfast can be enjoyed on the waterfront deck or front lawn under a towering elm tree. Each afternoon fresh-baked cookies are put out for guests. A warming fire in the fireplace takes the chill out on crisp fall days. Harbour Towne Inn on the Waterfront is open most of the year. It goes without saying that a primary objective for travelers to Maine is to indulge in the state’s most sought-after staple – lobster. And we found some great places to sate this appetite. 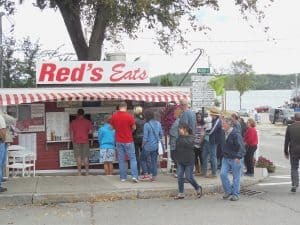 Our first recommendation – a must experience – is Red’s Eats in Wiscasset. 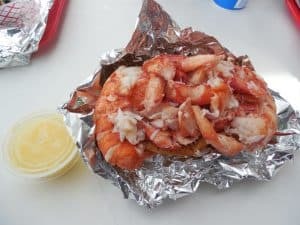 Located on Route 1 between Bath and Boothbay, Red’s Eats has been serving the freshest local lobster, seafood, hot dogs and burgers from this iconic roadside stand for generations. lived up to its reputation as one of the best in Maine. Robinson’s Wharf, a local institution, has been operating in Southport for 45 years. For lobster lovers the choices are varied. In addition to the always popular steamed dinner or fresh lobster roll, Robinson’s offers a Lobster Quesadilla, Lobster BLT, Lobster Mac & Cheese, and – for an added touch of Maine – a Lobster and Blueberry Salad. Shaw’s Fish & Lobster Wharf is set on one of the most picturesque Maine “working” fishing harbors. So picturesque that it was the setting for the movie “Message in a Bottle” with Kevin Costner and Paul Newman. The focus at Shaw’s is obviously on lobster, with lobster dinner specials of single, twin and triple lobsters. Or you can pick out your own larger lobster in the lobster pound downstairs. Shaw’s menu also features a wide variety of broiled or fried seafood, grilled steaks, as well as its clam or fish chowder and lobster stew. 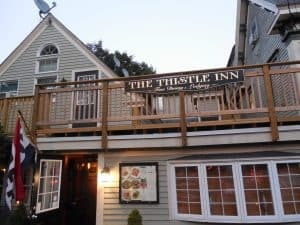 We found the Thistle Inn a great choice for fine dining. Built in 1861 as the home of a prominent sea captain, the Thistle Inn has been lodging and feeding guests in its classic colonial-styled dining rooms since 1960. Open year round, The Thistle Inn features a variety of seafood delicacies like Baked Haddock, Seared Diver Scallops, and Lobster Paella. But we were thinking of something other than seafood for our last night in Boothbay. The Thistle offers a wonderful Roasted Half Duck with Wild Mushroom Risotto, Mediterranean Lamb Chops, and Grilled French Cut Pork Chop. The atmosphere – especially on the patio where we sipped cappuccinos by a glowing fire pit – is casual, while the service is attentive and the cuisine exquisite. Maine’s MidCoast region offers a wide variety of activities on land and the water. Stroll one of the area’s picturesque beaches, hike some of the trails in the many Land Trust preserves, or enjoy a boat trip from one of the many harbor towns. Exploring the beautiful rocky coast with its numerous picturesque coves and iconic lighthouses kept us busy. One of our favorite lighthouses was Pemaquid Point in Bristol. The Lighthouse Tower and Fishermen’s Museum are open to explore. The Lighthouse Park grounds are a great place to enjoy a picnic while admiring the scenic coast. 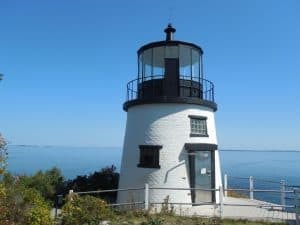 We also visited Owl’s Head Light and Rockland Breakwater Light. A pleasant 1-mile walk on the rocks of the breakwater leads directly to the Breakwater Lighthouse. Admiring Maine’s beautiful coastal scenery from the water is easy. Take a sightseeing cruise or island ferry, paddle a kayak, or relax on a schooner sail. 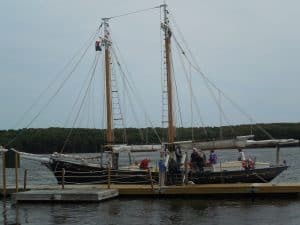 Be sure to book a two-hour sail of Boothbay Harbor aboard the Schooner Eastwind for great views of and interesting facts about many of the harbor’s islands. A variety of whale watch and puffin watch cruises are also available at the docks, as well as trips to other islands such as Monhegan. Lovers of all things nautical will enjoy the Maine Maritime Museum in nearby Bath. In addition to the museum’s indoor and outdoor exhibits, daily lighthouse and nature cruises are available. 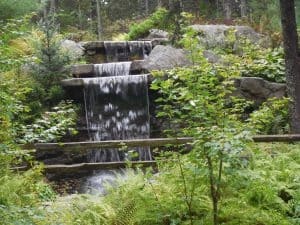 While in the Boothbay area you must experience the Coastal Maine Botanical Gardens. With nearly 300 acres of cultivated gardens, woodland walks, and shoreland trails, the Gardens have been ranked # 1 on Trip Advisor’s “Top Ten Public Gardens in the U.S.” A variety of themed garden attractions, including an imaginative Children’s Garden, provide a beautiful retreat for people of all ages. When the weather turns cold and snow covers the ground, the Gardens continue to shine with hundreds of thousand LED lights for the magical display that is Gardens Aglow. We tried to work off some calories with a few trail hikes in the Porter Preserve and Oven’s Mouth Preserve of the Boothbay Region Land Trust. Both of these hikes offer some very scenic coastal views. MidCoast Maine has numerous opportunities for hiking – for a growing list of trails and preserves open to the public visit www.travelmidcoast.com/getoutside. Maine’s MidCoast & Islands Region is sandwiched between two very popular areas of the state – Ogunquit, Kennebunkport, and Portland to the south and Acadia and Bar Harbor to the north. But don’t overlook the beauty and allure of this coastal region. It is classic Maine.